Finding meaningful work is a goal many people strive to achieve, and people with developmental disabilities often want the same opportunity. Since Ohio’s Employment First initiative was signed into law four years ago, it has raised the expectations for people of working age with developmental disabilities. The initiative also required data tracking for employment services providers and County Boards of DD. This information, which includes wages received, type of work, transportation, number of hours worked per week, benefits received and other data, can be analyzed for trends to help guide decisions and resources in the future. In Hamilton County, it’s no surprise that nearly 40 percent of people with disabilities work in the food service industry, which has long been a strong employer of people with disabilities. According to the Bureau of Labor Statistics, “restaurants and other eating places have gained 1.2 million jobs since 2010.” Strong job growth in this sector helped more people with developmental disabilities to find jobs. Marketing, sales and retail is the second most popular occupation type with 25 percent of the total jobs. 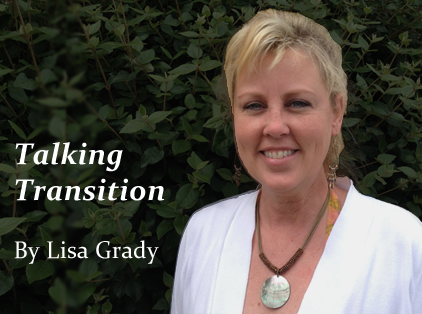 Many retailers are able to utilize people with developmental disabilities in various roles within their respective organization. Providers of employment supports are working diligently to build and maintain relationships with hiring managers so customized options for employment are becoming available. Many large retailers such as CVS, Walgreens and Kroger, to name a few, are now concentrating on developing disability hiring initiatives to increase diversity in their respective organizations. This is a positive trend and will help to increase options for job seekers in the future. The healthcare job category is currently at 3 percent of the total employment picture in Hamilton County. National trends in this field indicate that there will be substantial opportunity for employment growth. According to the Bureau of Labor Statistics, “healthcare industries are expected to have the fastest employment growth and to add the most jobs between 2014 and 2024.” This substantial growth could lead to more opportunities for people with developmental disabilities to contribute in the healthcare field. Marketing and outreach to this industry may be a sound strategy over the upcoming years. Our data, in the chart below, represents more than 10 occupation types, which shows more businesses are beginning to see the benefits of hiring people with disabilities. It’s also encouraging to see more available career options for people with developmental disabilities, who have the right to make informed decisions about their chosen career path to obtain jobs in community settings that meet their individual needs. People with developmental disabilities can complete almost any type of work when given the opportunity. Employment is a priority for Hamilton County DD Services, and we will continue to work with businesses to expand opportunities for people with developmental disabilities to live and work in their communities. 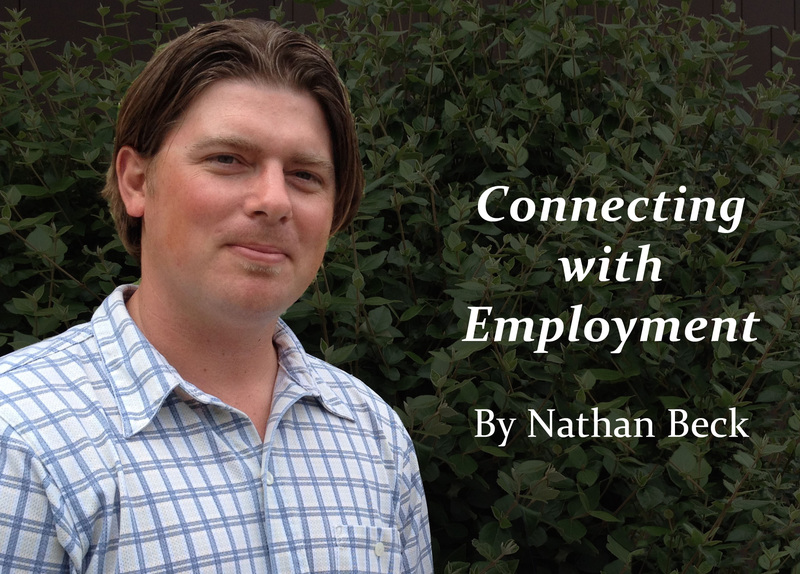 Nathan Beck is the Employment Coordinator for Hamilton County Developmental Disabilities Services. Column: How does having a job impact your benefits? Many parents of students receiving Supplemental Security Income (SSI) are reluctant to allow their high-school-age child work due to the misunderstood impact that earned income has on a benefit check. It is true that earned income will cause the SSI check to decrease, however, it is also true that earned income causes overall total income to increase. This happens because Social Security will exclude more than half of a person’s countable earned income before they reduce the SSI. Did you know that the work incentive for SSI recipients under the age of 22 who are regularly attending school, called the Student Earned Income Exclusion (SEIE), allows for someone to exclude up to $7,180 of earned income per year and $1,780 per month? For example, if someone earned $885 a month from working, Social Security would count only $400 of that amount against the $733 SSI check. This would leave them with $333 in SSI, plus $885 in earned income, for a total of $1,218. As you can see, a person receiving SSI who is also working always comes out on top. In addition, what if I told you that by applying the Student Earned Income Exclusion (SEIE), a person receiving SSI and working can come away with even more money than what was described in the previous example? A student working part-time and earning about $598 a month gets to keep their full $733 SSI check and their $598 earned income due to SEIE. That is a total of $1,331 a month, which is nearly double the amount of the SSI benefit. Did you also know that when a person receiving SSI goes to work, not only do they increase their earnings and develop a work ethic along with valuable experience and skills, but they also pay into Social Security? This means if they pay enough into Social Security, they will eventually earn enough credits to draw disability benefits off of their own work record. In other words, they’d be eligible for Social Security Disability Insurance (SSDI). The maximum amount of work credits that anyone can earn, disability or not, is four per year; one credit is $1,220 of earned income. Therefore, if someone earns more than $4,880 a year, they would have earned the maximum amount of credits anyone could earn in a given year. It is also important to know that the younger you are, the fewer credits you need in order to draw off of your own work record. For example, a person younger than 24 years old, need only to have earned six credits in order to draw off of their own work record. That is a total of $7,320 of gross earned income. For someone who started working part-time when they were 16 years old, it is likely that at the time they turn 18, they’ll be eligible to draw off their own work record. This is beneficial because having Social Security Disability Insurance (SSDI) as opposed to Supplemental Security Income (SSI) means having access to more extensive and supportive work incentives. As you can see, it’s not always true that working hurts benefits, talk to a benefits specialist with more questions. You will then be able to make an informed choice regarding your employment goals. Don’t let fear of losing your benefits remain a barrier to you accepting more pay, hours or even a job! Antonio Akins is the Benefits Specialist for Hamilton County Developmental Disabilities Services. Have you ever felt the influence of your peers? Maybe it was going skydiving after your friends convinced you to try it. Maybe it was volunteering with your colleagues in your community. Or perhaps it was signing up for a benefit walk to help a cause your peers also support. Recently, I read an article that discussed the power of peer influence on one’s decision-making process. It made me think about how this concept could be applied more broadly to employment people with developmental disabilities. Why not use this potential power of peer influence to promote positive interactions among individuals thinking about working in the community? Merely 19 percent of people with disabilities are actively participating in the workforce, according to U.S. Department of Labor statistics. Competitive employment results in many positive outcomes, so why aren’t more people participating? From my experience in the field, lack of exposure to the possibilities of employment can be a hindering factor. Also, individual choice is a factor and some people may not have a desire to work in the community. Stepping out into the workforce can come with risks, and often it may seem that the risks far outweigh the benefits. However, offering forums to talk about employment possibilities can help others seek out opportunities of interest, or, at the very least, provide information. These forums also offer support in an informal, non-threatening and relaxed environment. At Hamilton County DD Services, we recently put this concept into action. Latasha Walker has worked at Beckman Adult Center for many years, and this summer she made the decision to find a community job. She was hired by LaRosa’s Pizzeria and shared her story with her peers who attend Kidd Adult Center. 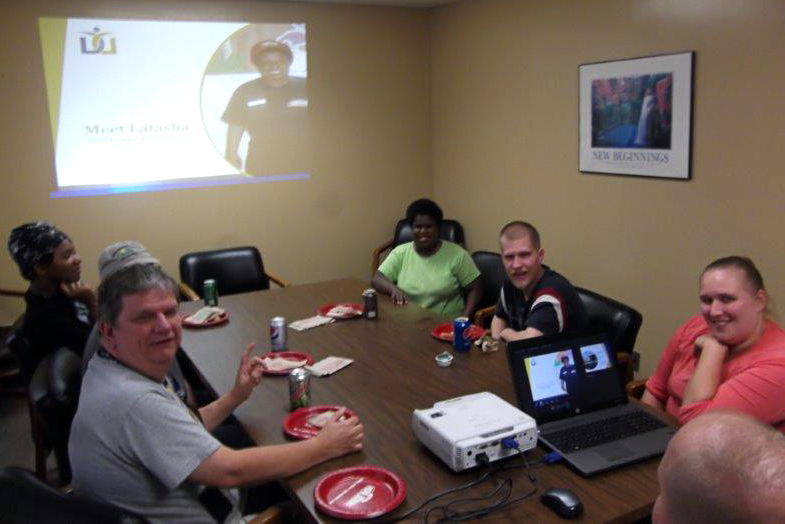 Latasha Walker talked to her peers at Kidd Adult Center about community employment. The conversation was thought-provoking and many who listened to Latasha’s story asked her questions about transportation, wages and other topics related to work. This shows her peers were engaged and interested in learning more about having a job outside of the adult center environment. Positive encouragement and the opportunity to hear a successful employment story may elicit more interest and help someone understand the benefits of working in the community. And maybe this forum, like others, motivated someone to seek out potential opportunities. Making the choice to join the workforce is a personal decision based on that person’s interest in employment. Ohio’s Employment First initiative has changed the expectations for individuals with disabilities of working age, placing employment as the preferred and expected outcome. Our agency and others in Ohio have many great resources to assist individuals in their quest for employment. Hamilton County DD Services is committed to making employment a reality for individuals who have a desire to work.